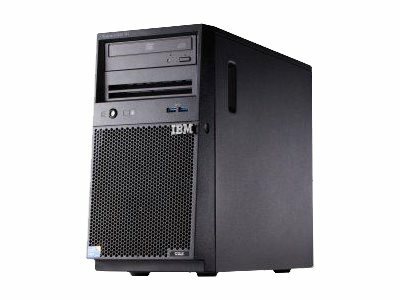 The single-socket IBM System x3100 M5 server provides business class reliability and performance in a compact tower, optimized for small to medium-sized businesses and distributed environments. Equipped with Intel Xeon E3-1200 v3 series processors, USB 3.0 for fast data transfer, 1.35V low-voltage memory for power savings, and up to four levels of RAID for enhanced data protection, the x3100 M5 brings new levels of performance to your workloads while maximizing energy savings. This efficient tower meets your business needs today and offers upgrade potential when your requirements grow. UEFI, IBM Integrated Management Module II (IMM2), basic light path diagnostics, Automatic Server Restart, IBM Systems Director, and IBM ServerGuide. Optional IMM Advanced FoD Upgrade for remote presence (graphics, keyboard and mouse, virtual media) is available. 4GB (1x4GB) 1600MHz ECC Unbuffered (UDIMM) DDR3 SDRAM, expandable up to 32GB. There are four DIMM slots. One slot contains a removable 4GB module; the others are available. ECC Unbuffered DIMMs (UDIMMs) are supported only. RDIMMs are not supported. Matrox G200eR2 with 16MB VRAM integrated into the IMM2. NOTE: There is no USB 3.0 support for RHEL 5.1 or VMware ESX 5.1, 5.5. ServeRAID C100 controller, supports software RAID 0/1/10. Integrated two-port Gigabit Ethernet (Broadcom BCM5717). One port is shared with the IBM Integrated Management Module (IMM).